Biosolids (sewage sludge) provide valuable plant-available nutrients and have useful soil conditioning properties. They are subject to regulations which require that the application rates of specific heavy metals and their concentrations in soils are not exceeded, that disease risks to stock and humans are minimised and that applications should match the requirements of crops. Rates of applications are therefore important and so is the balance of nutrients. Water companies go beyond the regulations by agreement with stakeholders. Potential contaminants have been greatly reduced over the years by cooperation with industry, with their removal at source, and by legislation that has prevented the manufacture and sale of hazardous substances. Biosolids provide useful quantities of nitrogen and phosphate, but only modest amounts of potash and magnesium because these elements are quite soluble and are washed out in the treated water. Lime stabilised biosolids are a useful liming material. 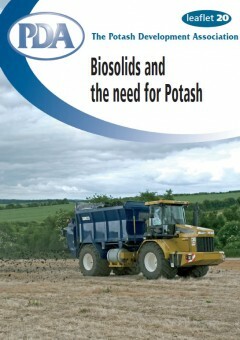 Because most plant species require a greater total supply of potash than any other nutrient it is vital to complement biosolids with appropriate applications of potash fertiliser. These figures provide a guide to typical contents but these vary widely and reference should be made to your water operator. Source: DEFRA Fertiliser Recommendations RB 209 8th edition. All soils must be sampled and the results must be available before the first application of biosolids, and be resampled thereafter when heavy metals could have accumulated. Biosolids must not be applied to agricultural land when the concentrations of certain heavy metals in the soil (lead, cadmium, mercury, copper, zinc, and nickel) are greater than specified limits, according to soil pH. The rate at which heavy metals in biosolids may be added to soil is restricted. Biosolids must not be applied if the soil pH is below 5.0. Restrictions on use of different materials and harvest intervals for different crops must be adhered to, see Safe Sludge Matrix, page 3. Biosolids application rates must take account of the fertiliser needs of the rotation; the use of biosolids must not impair soil quality nor pollute ground or surface waters. The farmer or landowner must provide the biosolids producer/supplier with relevant information about the application of other materials to the land. The biosolids producer/supplier must provide information to the farmer or landowner about the nutrients and heavy metals applied in the biosolids. Statutory Management Requirement No. 3 (SMR 3) requires compliance with the Sludge (Use in Agriculture) Regulations 1989 and the Code of Practice for Agricultural Use of Sewage Sludge. HMSO, London 1996. The biosolids supplier will ensure that SMR 3 is observed and also SMR 4 (Nitrate Vulnerable Zones), as far as biosolids are concerned. Use of biosolids can be considered to contribute to the requirement to maintain the land in ‘Good Agricultural and Environmental Condition’ (GAEC) because it improves soil structure, builds soil organic matter and increases water infiltration rate and resistance to soil erosion. In the latter part of the 1990s, ADAS facilitated discussions between the British Retail Consortium, Country Land and Business Association, Environment Agency, National Farmers’ Union, Department of Environment Transport and Regions, Ministry of Agriculture Fisheries and Food, Water UK and other stakeholders to review the Regulations and agree additional requirements that would enable the use of biosolids on farmland to be welcomed by all parties as part of sustainable development. The Agreement on the method of working came into force on 31st December 1998. All agreed that the existing Regulations dealt with chemical risks adequately. Measures were agreed to further control the risk of disease transmission compared with the Regulations. Sludge treatment was to be based on HACCP (Hazard Analysis and Critical Control Point) principles, with two classes of treated sludge and defined rules on how they could be used. With this additional control and with FACTS training for advisors, all parties agreed that using biosolids to complete nutrient cycles and conserve organic matter is part of sustainable development. Conservation and recycling of phosphate by using biosolids to complement mineral fertiliser is especially relevant to sustainability; the phosphate industry estimates that the world’s reserves will be exhausted in between 100 and 300 years at the current rate of exploitation, depending on price. The agreement was published by ADAS as the ‘Safe Sludge Matrix’; it affects all applications of biosolids to agricultural land. Defra planned to revise the Sludge Regulations to embembody the provisions of the Agreement and published a consultation in 2001, but revision now looks unlikely. Not permitted on land for food crops since 1999, nor for non-food crops since 2005. These are biosolids that have undergone biological, chemical or heat treatment to reduce the fermentability and possible health hazards. The commonest treatment is anaerobic digestion. Conventional treatment ensures that at least 99% of pathogens have been destroyed. These are biosolids subjected to treatment that virtually eliminates any pathogens. These materials will be free from Salmonella and the treatments will destroy 99.9999% of all pathogens. These guidelines summarise the current regulations on the use of biosolids but are subject to regular review and change – if in doubt check with your biosolids supplier, your buyer or the contacts in the Matrix cropping categories table. All applications must comply with Sludge (Use in Agriculture) Regulations and Defra Code of Practice for Agricultural use of Sewage Sludge. or download the Safe Sludge Matrix for Agricultural Land or the Safe Sludge Matrix for Industrial Crops from the ADLib website. 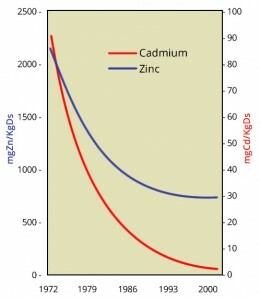 Best fertiliser practice requires nitrogen (N) to be applied to an economic optimum level with timing matched to plant growth so that risk of N loss to the environment is minimised. Excess nitrogen carry-over should be avoided. The Code of Good Agricultural Practice for the Protection of Water (1998) recommends a limit on the amount of total nitrogen to be applied in biosolids and other organic manures to no more than 250 kg/ha/year. Sludge cake which contain little available N may be applied at rates up to 500 kg/ha of total N in one application every two years in catchments less sensitive to nitrate leaching. More stringent limits apply in NVZs – at the field level it is not permitted to apply more than 250 kg/ha total nitrogen per year. Also, full allowance should be made crop-available nitrogen supply from biosolids when calculating how much inorganic fertiliser N (if any) a crop needs. The principles are quite different to those for nitrogen. Best practice requires the maintenance of acceptable levels of these nutrients in the soil on a long-term basis. Fertiliser applications should aim to raise soil phosphorus (P) and potassium (K) to such levels that no further economic response occurs, and then to maintain these levels in the soil by replacing the nutrients removed in harvested crops. At soil P Index 3 phosphate additions (biosolids or fertilisers) should not exceed crop offtake over the rotation. For most crops no phosphate is recommended at Index 4 or above, but biosolids may be applied, taking care to minimise the risk of run-off, soil erosion or leaching. N and K are essential partners. If potash is limiting, the crop will not respond fully to nitrogen thus penalising yields and product quality. Biosolids can provide large quantities of nitrogen which must be balanced with adequate potash to ensure its efficient use. Inefficiencies of N uptake and use in the plant may result in significant losses of N to the environment if potash levels are deficient. Do not rely on visual symptoms in a crop to determine the adequacy of potash or phosphate supply. Deficiency symptoms are easily confused with other problems, frequently appear too late for damage to be prevented or may be totally absent despite yield/quality penalties. The best way to ensure the maintenance of adequate soil fertility is to apply nutrients to replace those removed by cropping, and to monitor soil reserves by regular analysis every 4-5 years. Unlike many factors, potash fertility is within a farmer’s control and it is unwise to allow low reserves of this relatively inexpensive input to prejudice crop performance. The penalty from inadequate potash will depend upon the soil type, the crop and the growing conditions. Even with so-called ‘less responsive’ crops such as cereals or grass the effects can be large. 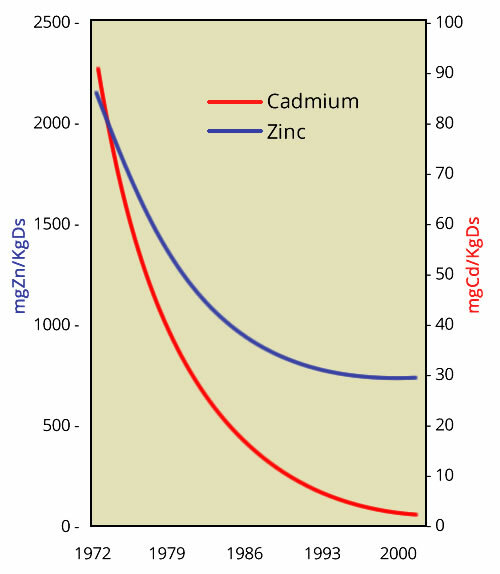 For arable crops the typical uptake pattern of major nutrients is shown in the graph. Relatively small amounts of nutrient are required during the establishment period, but such supplies are vital to the development potential of the crop. Daily uptake increases dramatically during vegetative growth and restriction of nutrient supply at this stage can critically affect final yield and product quality such as grain sample, tuber size and numbers, sugar content etc. Peak uptake for potash is around flowering time for most combinable crops and at the end of the growing season for root crops. Peak uptake for nitrogen and phosphate coincides with the end of season. Plants must be able to take up nutrients when required at the rate to match potential growth. The total supply must provide for peak uptake rather than just the quantity removed at harvest. These can be very different especially for potash. With grazing, the livestock are continuously re-cycling nutrients back to the soil via dung and urine so replenishment needs are low. However hay and silage are similar to the arable situation – but more so! Grassland conservation removes the whole crop, possibly several times a season, thus both uptake and removals of potash can be very large. – cutting Apply recommended rates before each cut up to a maximum of 90 kg/ha. Apply amounts above this in the previous autumn/winter. For single cut systems potash can be applied at anytime over winter or in early spring for the following season. Note: recommendations in this leaflet relate to ammonium nitrate exchangeable potassium and the standard Index classification of results. If more than 190 kg/ha of potash is required some should be applied in autumn or earlier in the rotation. Sodium (salt) is also needed for these crops except where soil Na is more than 40 mg/l as in some organic soils and fen silts. Normal requirement is 200 kg/ha Na2O which is equivalent to 150 kg/ha Na. Salt should be applied at least 3 weeks pre-drilling. Fertiliser policy should be tailored to individual situations taking into account: rotation, crop grown, yield, treatment of residues such as straw, soil type and soil fertility level. Refer to other PDA leaflets or to the MAFF RB209 recommendations for precise guidance for individual crops. Check soil nutrient status every 4-5 years by soil analysis.